A major part of the Hagginwood Park Master Plan may be set into motion at tomorrow afternoon’s City Council Meeting. 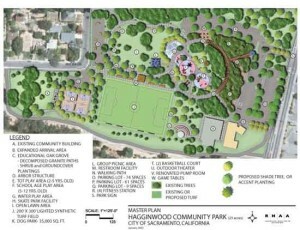 A design-build contract will be presented on the Resolution Calendar portion of the Agenda authorizing the City Manager or the City Manager’s designee to execute a design-build contract with Grass Valley Turf Company for the Hagginwood Park Lighted Synthetic Turf Soccer Field Project, to procure, and to purchase the synthetic turf. The synthetic field soccer field is a major piece of Hagginwood Park’s Master Plan, which was reviewed and supported by the Parks and Recreation Commission (PRC) on March 31, 2009. The meeting is at its older 2pm time; there still is an evening meeting at 6pm. June 22, 2010 in Uncategorized.